Brown Bottle is a collection of over 200 digital border templates for photo greeting cards. Templates can be downloaded for free and used in GIMP, Paint.NET, Adobe® Photoshop®, or other image editing software to design and print custom cards using your own pictures. Browse all templates by tag. 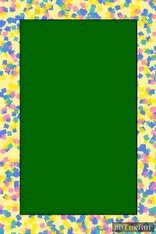 This template is a multi-color confetti design - just add your own picture for a custom photo card. You can print your custom cards at home, or have them printed at a photo lab.